The Barilift 1000 Scale adds new life and function to your existing patient lifter. Simply attach between your boom arm and hanger bar and you have just turned your patient lifter* into a precision scale system. 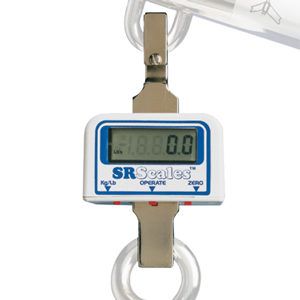 This workhorse is built to last with the quality and reliability you’ve come to expect from SR®Scales. The Bari 1000 Weight Module is a compact precision scale system designed for use with approved* lifter designs employing compatible boom and hanger configurations. Completely self-contained, the Bari 1000 Weight Module combines the latest microprocessor and load cell technology to provide accurate and repeatable weight data with a calibrated accuracy of 0.1%. One button Auto-Zero Electronics makes patient weighing quick and easy. The Bari 1000 Weight Module derives its power from a single 9-volt battery which will provide up to 3000 readings. Light Weight - Weighs just over 1 pound. Bring it with you when you need it. Built to Last - Load cell is machined from a single block of steel to maximum strength and performance. STEP 1: Attach the top hook of the SR801 Weight Module to the loop of the lifter boom, making sure that the hook is fully engaged. Important: Tighten retainer screw until fully engaged. STEP 2: Attach the swivel bar to the bottom of the scale system. Refer to lifter manual’s instructions. STEP 3: Attach the sling/stretcher securely. STEP 1: Attach the scale system as described in the lifter manual’s instructions. STEP 2: Attach the empty sling/stretcher to the swivel bar securely. STEP 3: Ensure the scale is hanging vertically and is to free to pivot at both the top and bottom connection points. 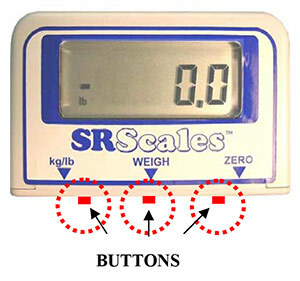 Ensure the scale system is free and clear of any obstructions and press the “ZERO” button to set the system to zero. “0” will pan across the screen for a couple seconds. Display will then read “0.0”. STEP 4: Press Kg/Lb button to choose display modes. STEP 5: Remove the sling/stretcher and position patient. Reattach the sling to the scale system ensuring the scale is hanging vertically and is free to pivot. STEP 6: Carefully lift the patient and when the motion has stabilized, press the “WEIGH” button to display the weight data. Do not touch the patient or sling/stretcher during this step. STEP 7: Carefully lower patient when weighing process is complete. STEP 8: Re-Zero the scale system before each weighing. A single 9-volt battery powers the SR801 Weight Module. This battery should provide approximately 3000* readings before replacement is needed. An indicator will appear on display. Unsnap access door on back of unit to change battery. Note: The load cell contains no user serviceable components and should be serviced by qualified personnel only. Any unauthorized tampering will void the warranty.